Goodreads: Sparkling white snowdrifts, beautiful presents wrapped in ribbons, and multicolored lights glittering in the night through the falling snow. A Christmas Eve snowstorm transforms one small town into a romantic haven, the kind you see only in movies. Well, kinda. After all, a cold and wet hike from a stranded train through the middle of nowhere would not normally end with a delicious kiss from a charming stranger. And no one would think that a trip to the Waffle House through four feet of snow would lead to love with an old friend. Or that the way back to true love begins with a painfully early morning shift at Starbucks. Thanks to three of today’s bestselling teen authors—John Green, Maureen Johnson, and Lauren Myracle—the magic of the holidays shines on these hilarious and charming interconnected tales of love, romance, and breathtaking kisses. Kritters Thoughts: Three short stories that are sweetly linked and I loved them all individually and together! Having each story told from a different character allowed each author to use their own distinctive voices, but as their characters make big appearances in each other's stories it linked them so geniusly. The first story takes you on a train trip to the North Carolina setting and while introduces the reader to the upcoming characters still has a plot of its own. The following stories take their characters on rides, but still includes the previous characters - how they did this I have no idea and I want to know!! 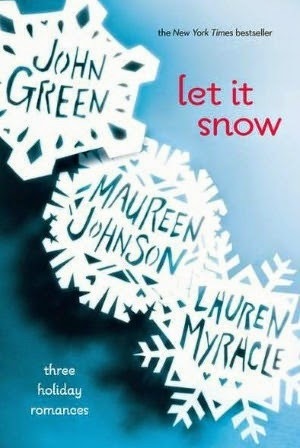 I would love to have another set of stories like this with Christmas at the center or not - wouldn't matter to me!